What are Artificial Turf and Playgrounds Made Of? Can They Cause Cancer? Obesity? Asthma? Is your child playing on rubber and plastic instead of grass? Grass has been replaced with artificial materials at schools and parks all over the country. Regardless of what they look like, there is growing evidence that all artificial fields and playgrounds are made with materials that can be dangerous for children and adults. Many athletes don’t like artificial turf, and only 2 professional ballparks now use it, and many football stadiums have also switched back to grass. In addition to plastic “grass,” rubber and other synthetic materials are used to keep the “grass” in place and provide more cushioning. Unfortunately, artificial turf increases “turf burn” abrasions from sliding, puts additional stress on joints, and can become dangerously hot in the sun. More than 20 million recycled rubber tires are processed every year for playground surface cover and sports surfaces. Using tire scraps seemed like a great idea at first – keeping them out of landfills and providing a potentially softer landing on the playground. It was known that burning old tires released harmful, smelly chemicals into the air, but parents didn’t realize that recycled tires and new rubber used on fields and playgrounds can also be dangerous. Why Aren’t They Proven Safe? 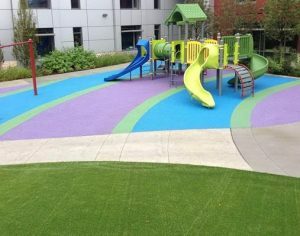 There is no government agency that requires synthetic playground surfaces to be tested before they can be sold. In fact, the materials used in these products are often not made public — the lack of disclosure is justified as “trade secrets.” However, some researchers independently have examined the safety of these playground surfaces. It would not be ethical to conduct a study exposing children to tire shreds, knowing they could be unsafe, so the California Office of Environmental Health Hazard Assessment conducted three studies that mimicked children’s exposures instead.4 Results showed that a single incident of eating or touching tire shreds would probably not harm a child’s health, but repeated or long-term exposure might. Five chemicals, including four PAHs, would get on children’s skin if they played on these surfaces. One of the PAHs, chrysene, was higher than the level considered safe, and could increase the chances of a child developing cancer. In addition, only 10 of the 32 California playgrounds studied met the state’s safety standard for falls, which meant that falling could cause a brain injury of other serious harm. In contrast, all five surfaces made of wood chips met the safety standard. In Washington, D.C., 37 of their 51 artificial turf fields failed 2017 safety tests, due to hardness scores above 165. That’s what the turf industry considers the maximum score for safety. A 2015 report by Yale scientists analyzed 14 different samples used for school athletic fields and playgrounds.5 They detected 96 chemicals, most of which have never been carefully studied, so their health risks are unknown. However, 20% of the chemicals that had been tested are considered to probably cause cancer. In addition, 40% are irritants that can cause breathing problems such as asthma and/or irritate skin or eyes. What About your Schools or Parks? Tiles made from tire shreds and binder that have been factory-molded, then glued to a playground surface. Tire crumb or “virgin” colorful rubber that is “poured in place” (PIP) can contain many of the same dangerous materials as recycled tire shreds. Children are much more likely to be harmed by exposure to chemicals in their environment than adults because they are smaller (so the exposure is greater) and because their bodies are still developing. Pregnant women should be even more careful to avoid these exposures. Parents in many communities are persuading local officials to conduct safety tests on artificial turf fields and playgrounds every year, and to install grass or wood chips because they are safer in terms of chemical exposure, heat, and if their children fall. 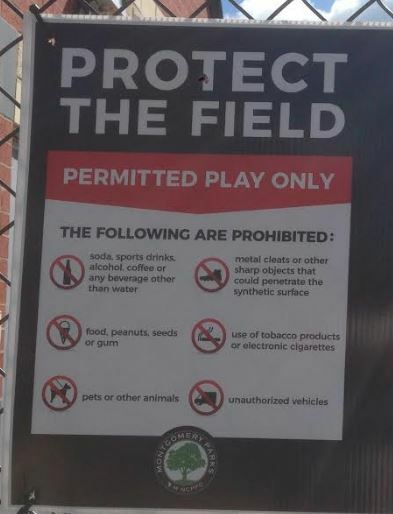 But as you can see from the photo below from a school in Silver Spring, Maryland, there are more likely to be signs aimed at protecting the fields, rather than protecting the children using those fields. Children should avoid mouth contact with playground surfacing materials. Some of these materials are small and look like seeds, mulch, or small candies. They may pose a choking hazard as well as a dangerous chemical exposure. Avoid eating food or drinking beverages while directly on playground surfaces and wash hands before handling food. Limit the time at a playground on hot days. Children tell us they can often see the heat waves rising off the fields on warm, sunny days. The temperature of artificial turf can be 70 degrees hotter than the air or natural grass. Clean hands and other exposed skin after visiting the playground, and consider changing clothes if residue from the rubber is visible on fabrics. These safeguards will help reduce your child’s exposure. However, if your child is playing on these fields for hours every week, there is still reason for you to be concerned. That’s why our Center has testified before the Washington, D.C. City Council and why we are working with parents across the country who seek our help in convincing their communities to choose grass and avoid artificial turf whenever possible. If you would like to download and print a PDF version, click here. US Environmental Protection Agency (EPA). Polycyclic Aromatic Hydrocarbons (PAHs)-Fact Sheet. November 2009. https://www.epa.gov/north-birmingham-project/polycyclic-aromatic-hydrocarbons-pahs-fact-sheet Accessed May 2016. Agency for Toxic Substances and Disease Registry (ATSDR). Polycyclic Aromatic Hydrocarbons. September 1996. http://www.atsdr.cdc.gov/toxfaqs/tfacts69.pdf Accessed May 2016. State of California-Office of Environmental Health Hazard Assessment (OEHHA), Contractor’s Report to the Board. Evaluation of Health Effects of Recycled Waste Tires in Playground and Track Products. January 2007. http://www.calrecycle.ca.gov/publications/Documents/Tires%5C62206013.pdf Accessed May 2016.